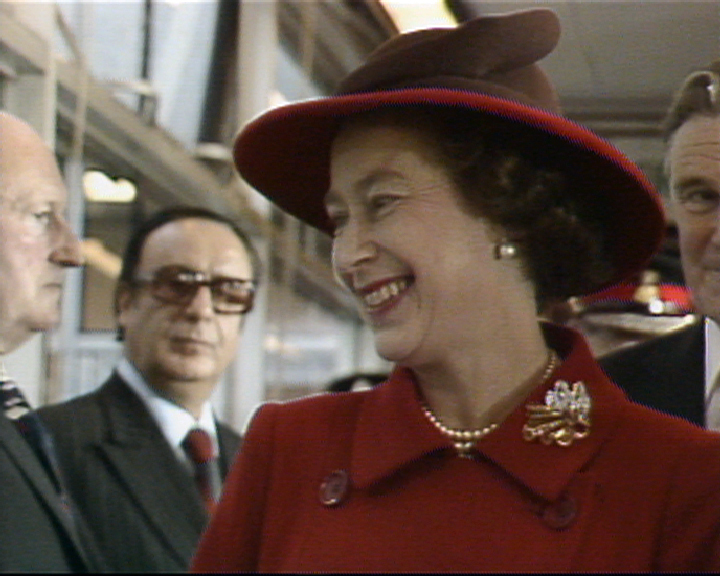 The Queen visited Pebble Mill to celebrate the building’s tenth anniversary in 1981. She went on the set of Pebble Mill at One and talked to several members of staff. She is pictured with Phil Sidey, Head of Pebble Mill in photos 2 & 5, Jim Dumighan in photos 3,4 & 7, the man with the glasses is Mahendra Kaul OBE, one of the Asian Unit producers at the time, and in photos 5 and 10 the man on the extreme left is probably the late Alan Ford from the Postroom. One person who was there but not pictured is the late John Pickles demoted from his job as head of BBC Scotland after his “Queen is dead” prank inevitably backfired.He was reduced to the ranks as manager of Radio WM & was definetly lurking wisely out of camera given the circumstances!He later took over BBC Hereford&Worcs. Thanks to Ian Collins from post production for making these shots available, and to Conal O’Donnell, Jayne Savage, Jane McLean and Dave Milligan for providing additional information.